Here is a list of some of my favorite clarinetists. It’s really important to listen to very good clarinet players to get a concept of the sound that you want to produce. No two clarinetists sound alike. The various tones of the clarinetists below vary greatly but I love each and every one of them. Type their names into youtube or other music websites and have a listen. Karl Leister-German, Retired principal of Berlin Philharmonic. My #1. I had the opportunity to perform for Karl Leister almost 10 years ago. He was a man of few words but everything he said was so important. An amazing musician and that tone…for me, that’s the sound. Sabine Meyer-German. Who didn’t want to play Rigoletto after Meyer’s CD “A Night at the Opera” was released? Trouble was trying to play with the lightness of articulation and clean technique that Meyer exemplified in each piece. She continues to amaze me with each new recording: the Stamitz Concertos, the Nielsen…I could go on. Paul Meyer-French. The Krommer Clarinet Concerto! This clarinetist has such a vibrant sound. He uses the whole color spectrum in his tone and I love it. I also love his use of vibrato. It colors the sound so beautifully! Harold Wright-American, Principal of Boston Symphony. Deceased. I wasn’t familiar with Harold Wright the day I found out he had passed on. Later, I heard what is still my favorite recording of the Schubert Shepherd on the Rock performed by Wright, Benita Valente, and Rudolph Serkin. For me that is THE RECORDING of Shepherd. Hands down. Ricardo Morales-Puerto Rican, Principal of the Philadelphia Orchestra. Morales has a very sweet and well-focused sound. I heard Morales play at the I.C.A. in 1997 in Lubbock, TX. He performed the Brahms Sonata in F minor. I had never and have never heard such a beautiful performance of this piece ever. The second movement sparkled. It was incredible! David Shifrin-American. I had the opportunity to play for David Shifrin when I was about 20 years old as a sophomore at WTAMU. The experience was overwhelmingly humbling and something I will never forget. He was very nice and helpful. Such a great experience. The clarinet studio under Doug Storey was able to hear him play with the Amarillo Symphony Orchestra–certainly a performance I will never forget. It was outstanding. My favorite recording of his is the Copland Concerto. Jon Manasse-American. Fave recording–the Weber Concertos. This is my all-time favorite recording of these. Emma Johnson-English. Ireland Fantasy. Her sound is not similar to other English clarinetists. There’s a richness to her sound and her articulation is not heavy like the articulation of some other English clarinetists. Another favorite recording of mine is her Malcolm Arnold Clarinet Concerto No. 2. Love it. Martin Frost-Swedish. If ever there was a rockstar on the clarinet it would be Martin Frost. Frost is like the Lady Gaga of the clarinet. Lady Gaga can sing anything. He can play anything. His sound is best described as sultry, controlled, not too bright, and well-balanced with a certain richness to it. Philippe Cuper-French. Francaix Clarinet Concerto. Light and elegant. Alessandro Carbonare-Italian. Luscious tone. Exquisite. Everything I hear with Carbonare is beautiful. 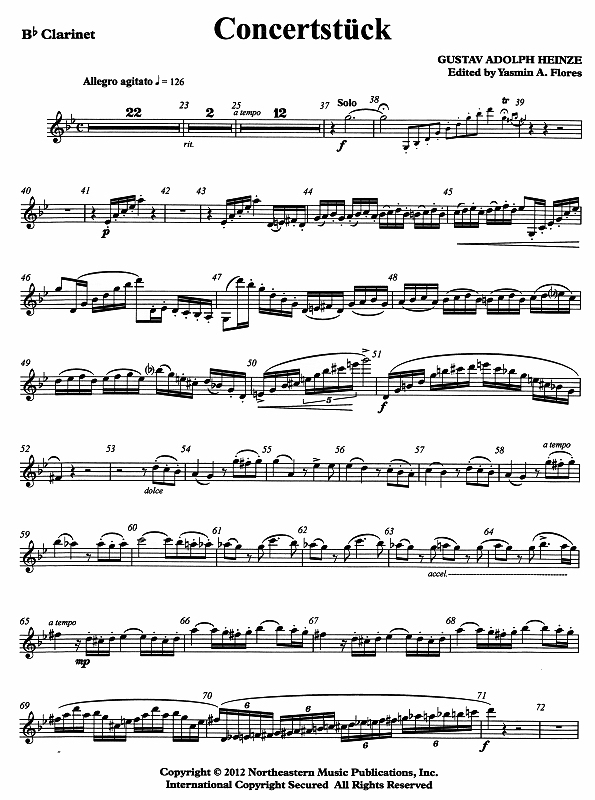 There is nothing strident about his tone even in the altissimo register it’s still rich and sweet. Anthony McGill-American, Principal of the New York Philharmonic. Another clarinetist with a lovely tone. My favorite tone of all of the American players. McGill is careful with every single note. His tone is velvety and his playing is refreshing. I look forward to what McGill continues to produce with the NY Phil. There is a fantastic video on youtube of him playing the Mozart Clarinet Quintet with the Pacifica Quartet. Stellar. Eddie Daniels-American. Not only a phenomenal classical player but equally wonderful as a jazz clarinetist, Eddie Daniels will always keep audiences wowed with his talents. Daniels is not only a wonderful musician but also a really down to Earth and sweet guy. He performed with the WT band about 14 years ago and left the whole clarinet section in awe of everything that came out of his horn. Artie Shaw-American. Deceased. The Artie Shaw Clarinet Concerto. Begin the Beguine. Artie Shaw was a player who was just as good and some argue even better than Benny Goodman. Sadly he quit his career altogether early on and died unnoticed on the same day that a tsunami hit the Indian Ocean and killed thousands. Reginald Kell-English. Deceased. I like Reginald Kell. As time goes by he has become more and more unknown but I really like recordings of him playing 20th century works. Alexey Gorokholinsky-Russian. This gentleman has a wonderful video on double-tonguing on youtube. He is a fabulous player! You can find other recordings of him on youtube as well. Giora Feidmann-Argentinian-Israeli. I am a huge Giora fan. I’ve never met him. I wish I could. I discovered Giora when my teacher sent me to the library to go have a listen to some Klezmer music. He asked me to find a piece I liked and order the music, so I did. The mail arrived and I received a CD and a book of lead sheets. The panic set in. I wanted to sound exactly like Giora. I took the CD and listened with some manuscript paper and figured out the solo. Check out arrangements on the my home page. I will never play with the joie de vivre that Giora has in his sound but I can always try!!! Burt Hara-American, Associate Principal of the Los Angeles Philharmonic. Former Principal of the Minnesota Orchestra. Another wonderful musician! I had the opportunity to play for Mr. Hara while I was a student at the University of Iowa. He was so energetic! He was bouncing around the room and was so excited to teach and play. I thought it was great. Alcides Rodriguez-Venezuelan, bass clarinetist with Atlanta Symphony Orchestra. His CD “The Venezuelan Clarinet” is the kind of CD that is enjoyed by everyone. His amazing playing coupled with the Latin rhythms of each song is what makes this CD so attractive. I can’t think of any other clarinet CD that would be welcomed by non-musicians. A wonderful clarinetist, bass clarinetist, and an all around nice guy. A true gem in the clarinet world. Paquito D’Rivera-Cuban. Grammy-award winning Latin jazz clarinetist Paquito D’Rivera is a fantastic entertainer and a true legend of our time much like Eddie Daniels. He performed at the University of Iowa and was absolutely sensational. Check out “Tico Tico” on youtube with Paquito. Robert Marcellus-American. Deceased. Former Principal of the Cleveland Orchestra under George Szell. Marcellus defined the quintessential American sound. His playing was very well controlled, no vibrato, and flawless. His Mozart Clarinet Concerto recording with Cleveland is regarded as THE recording to follow, even to this day. Sometimes we can get stuck in “Clarinet Land” and forget what our instrument is supposed to be imitating–THE VOICE! There are also transcriptions of things for clarinet based on pieces written for other instruments so it’s good to listen in. I have my favorite recording of each of these musicians but I’ll let you find them on your own and discover their magic!